WOW! This week went by super fast. Today's card is super simple in style. No pattern paper, just an image and some sewing....I can see this frog done in some paper piecing with some green/white polka dot pattern paper and a little heart on the frog for Valentine's day. Thanks for stopping by and see you back here Monday for the 2nd video in the Silhouette Studio series. Love this little card. The coloring is wonderful. Thankyou for more great tips. Have a great weekend. Adorable card. Love the coloring! This is such a cute card. Wonderful color shading. Love your little frog, but I want to tell you I was at a Copic 101 class and was told not to use Stazon ink because it's a solvent and would ruin your Copics. Suggested ink was any dye based ink or pigment ink which has been heat set. I went again yesterday to make sure and Momento or Aidrondack ink pads is the prime choice. Just thought I'd pass that on to you. This is too cute! Love the simpleness. froggie card is adorable! As is always so true...less is MORE! 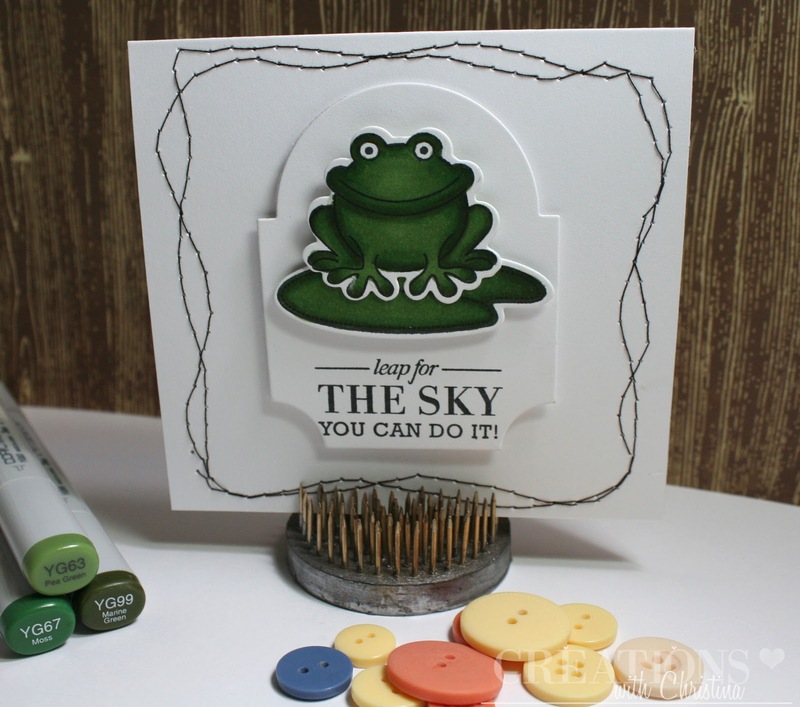 This card is so cute and just prefect for sending an encouraging note to someone. I really like your technique for copic coloring. I have never tried this myself, but would like to to. Thanks for all the details and leaving the listed supplies that you use. I love your blog. Cute card, the frog is adorable. Great coloring on the frog. this is a great card Christina (using the mat diecut with this image). The die link goes to the stamp set. Are the matching dies included with the stamps? Or sold seperatly? I can't find it on the website.